Jem’s Pit Stop is an American themed diner in the heart of West Yorkshire. The diner itself is covered in automotive memorabilia bursting with character featuring retro cars, lit up signs and other quirky features. The menu is incredible with lots of choice, no matter if you’re popping in for breakfast, lunch or dinner. You can choose from American styled hot dogs, steak burgers, fully loaded English breakfast and so much more. There’s also a fully licensed bar if you fancy a tipple. Don’t forget to check out what’s on the specials menu too! Got a sweet tooth? You need to try one of the home baked cakes from Jem’s, perfect with a cuppa tea or coffee. The cafe diner is attached as part of Jem’s Speed Shop, where you can get your fix of all things motorbiking in their very own dealership. There’s also a barber shop, tattoo parlour and clothing store too – you can really get everything you need when you visit this little Jem! 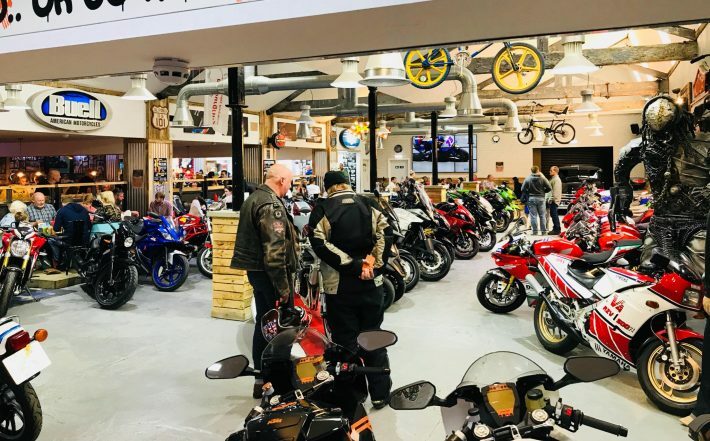 There’s a late night on a Wednesday night, the shop and cafe is open until 9pm which is perfect if you’re planning a post-work ride out and want a great pit stop for dinner and a catch up with your pals.